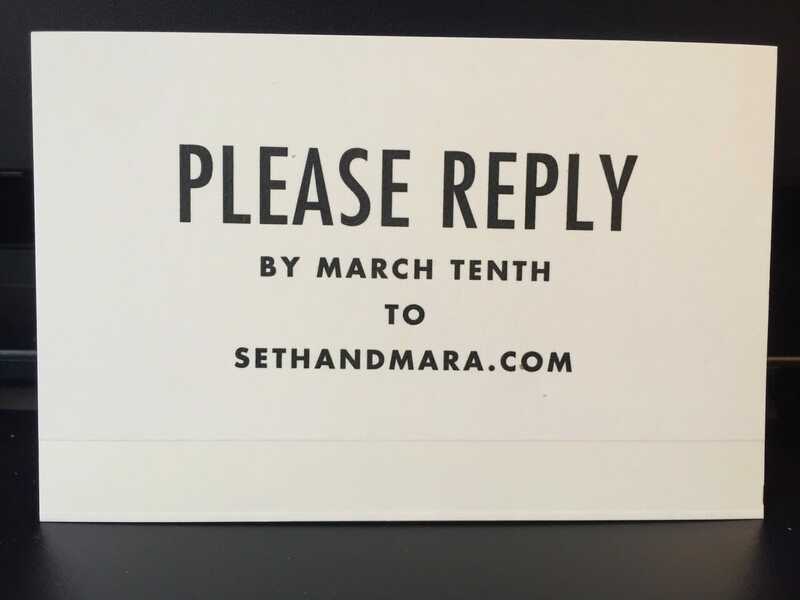 Today, we are addressing a question that has come up a few times recently: does a response card always require an envelope? In most cases, the answer is yes. You (the bride or the couple) send a response card with pre-stamped envelope to your guests so they can reply with their attendance and often times, food preference. This is the traditional way and in most cases, the easiest way to keep track of responses. 1) If you’re having an international wedding in a very small town that does not have a postal service, then it is not necessary to include a response envelope. 2) If you’re sending out the invitations 4 weeks or less before the wedding, there would not be enough time to reasonably expect the recipients to fill out the cards and send them back within such a tight time frame. If either of these is the case, it is acceptable to have a small insert card which states, “Please reply to ___ by ___” to direct guests to respond electronically. 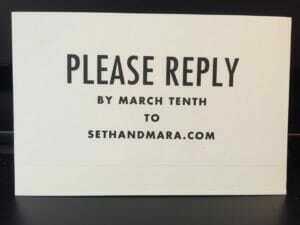 Example of a Vera Wang reply card requesting electronic RSVP’s. We’ve had both of these instances pop up recently, so we thought this information might be helpful! Of course, don’t hesitate to make an appointment to discuss what’s appropriate for your event!